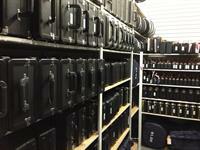 We are a full line musical instrument dealer. Selling everything from kazoos to full PA systems. Including Guitars, Basses, Drums, Keyboard, Amplifiers, Printed Music, PA speakers, amps, mixers, band and orchestra, accessories, and everything in between. We service and repair everything we sell including; Band and Orchestra instruments, guitars and basses, and all electronics including televisions, receivers, stereos, amps, etc. We also offer on-site private lessons with professional music instructors. Located on US Hwy 10, one mile east of Hwy 101 towards Anoka. Next to Jerry's of Elk River.